The Roberts Play 10 is a portable digital radio with a large display and easy to use controls. The radio receives FM, DAB and DAB+ signals which makes it ideal for new DAB+ services like Jazz FM and Magic Chilled. Although it is the cheapest model available from Roberts the display, controls and sound do not disappoint. The plastic case is a far cry from the luxurious and striking Revival models, yet it feels solid and well made. A modest loudspeaker is on the front of the radio, while the battery cover is on the back. A flexible carry strap is included on the left side of the set. Some of the cheapest digital radios use small displays and fiddly controls. Many manufacturers have also chosen to simultaneously display the station name and scrolling text, which can be at the expense of readability. 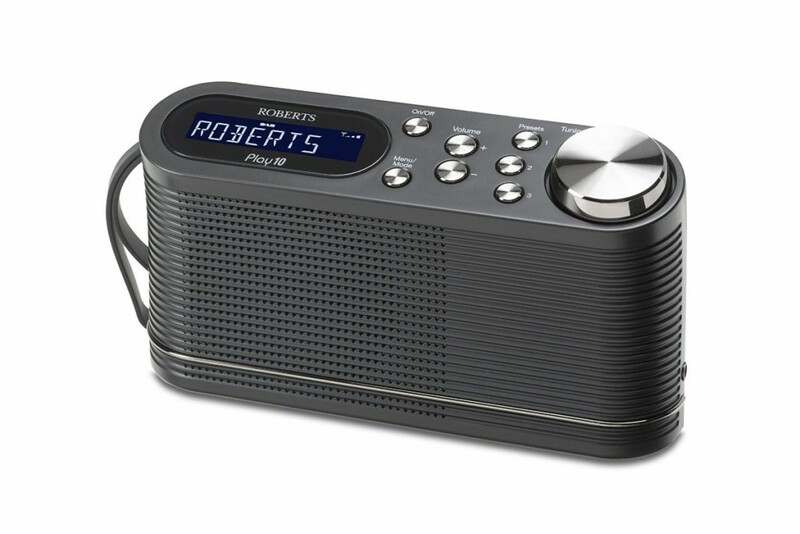 Roberts’ designers have succeeded in creating a radio which is easy to operate thanks to the simple controls. Unlike many digital radios, all of the buttons which control the set are situated on the top. A clear On/Off button is next to the LCD display. This only displays a single line of text, but does make it easier to see station names. A rotary knob for browsing the list is quickly becoming the most convenient way to look for stations. This is another helpful feature as the alphabetical station list continues to grow for many. Switching between FM and DAB/DAB+ is achieved with the mode button. A total of six station presets (three on FM and three on DAB) are offered with a button for each one next to the tuning knob. Power from 4 normal AA batteries means existing rechargables can be used. You can also power the Roberts Play 10 from the mains with the included AC adapter. Station names are shown by default on the display. It can also show scrolling text, signal strength, multiplex name, time, date and other station information. There’s no dedicated auto-scan button, so a re-scan is performed by holding the select/tuning knob. A common frustration is seeing old stations in the list which are no longer available. A question mark is shown next to these stations, which can be pruned from the list through the menu. Out of the box the Roberts Play 10 is smaller than you might expect. Any owners of previous Roberts models, such as the Gemini range, will find that the set is also much lighter at just 350g. The radio measures 18cm (7 inches) wide by 10.5cm (4 inches) high. The combined size and weight make it easy to carry around the house or garden. As a Roberts radio the guarantee covers failures due to manufacturing faults or component breakdown. The guarantee takes effect from the purchase date for twelve months. You can return the unit to the retailer who will send it to the company for a free of charge repair or replacement. Ease-of-use is a key part of the Play 10’s appeal which makes it an ideal first digital radio or present. For users who just want to receive their favourite stations, enjoy hiss-free sound from DAB and move easily between rooms the Play 10 is hard to beat. Verdict: Battery power, three clear preset buttons and a carry strap make this a great radio for gardening or relaxing outside.